We might need to re-tally that MVP voting. Carmelo Anthony delivered another stellar All-Star game last night in New Orleans, setting a benchmark with a record 8 three-pointers. Anthoyn started the game with a trey and remained the game’s most consistent shooter, shooting 55% from the field (10/18) and 8/13 from downtown. He finished with 30 points, 5 rebounds and 2 assists. The East would win the game 163-155 with Kyrie Irving taking home MVP honors (31 points, 5 rebounds, 14 assists). In last year’s game, Melo lead the East with 26 points, 12 rebounds and 3 assists in losing effort (143-138). Melo getting hot from the three when among fellow All-Stars is no new phenomenon. In the 2012 Olympics, Anthony set a U.S. Men’s team record with 37 points (10 three-pointers) against Nigeria in a 156-73 win. 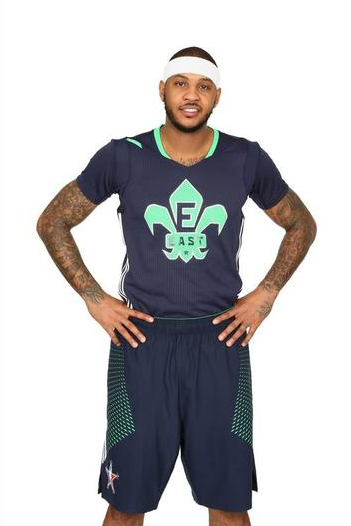 Check out Melo’s All-Star game barrage below.